Situated in the remote /Ai/ Ais/ Richtersveld Transfrontier Park in the most north western part of South Africa, the Richtersveld Transfrontier Wildrun is the perfect race for a wild adventure. A supported race, base camp each day is leap frogged to ensure that runners have maximum comfort in small individual tents, food is provided before and after each day's racing and bags are transported. This is no easy race. The Richtersveld Transfrontier Wildrun is a run through time in an environment that has been millions of years in the making. It is an ever-changing landscape that personifies remote and wilderness in the same breath. Navigating via GPS over five days, participants cover 200km on a route that starts on the Orange River at Sendelingsdrif and on day four, the race crosses over into Namibia for an ultimate transfrontier experience which concludes in the Fish River Canyon on day five. Including the oldest desert in the world, the /Ai/ Ais/ Richtersveld Transfrontier Park is home to an abundance of flora, wildlife, nomadic tribes, sulphur springs, archaeological sites and the stunning Tattasberg boulders. Pieter Van Wyk, an ever-present on the race and arguably one of the most knowledgeable people on the Richtersveld has experience and an outlook on life that extends far beyond his 28 years. Pieter is an attraction of the race and his nightly talks under African skies, accompanied by a roaring fire are one of the many highlights of race week. He clearly explains to everyone who enters the Richtersveld that it is not a right to be there but a privilege. How right he is! Cool nights follow hot days; no two days are the same. In previous years the race has remained in South Africa but in 2016, the race crossed the Orange River and an incredible two days of remote running followed in the mind-blowing Fish River Canyon - the 2nd largest canyon in the world behind the USA's Grand Canyon. Yes, this race truly is transfrontier! Weathered by millions of years of change, the landscape has been formed by water, rain and volcanic activity, it is a masterpiece of geology and botany, worthy of the most acclaimed art gallery or museum. The /Ai /Ais/ Richtersveld Transfrontier Park is a tough environment and few have had the privilege or the opportunity to experience this region. This is what makes this race so special. Owen Middleton (race director at Wildrunner) visited the area for the first time in 2006 and he was inspired. Working in conjunction with Nick de Goede (Park Manager) and Roland Vorwerk from Boundless South Africa, a dream became a reality and in 2014 the first edition of the race took place. To experience this landscape on foot, to see wild zebra, kudu, ostrich and an abundance of flora, fauna and bird life really does take participants back to their primal roots. Remoteness challenges the mind, the legs and the lungs of all, but each night a roaring fire, good food and huddles of tired runners telling camp fire stories compensates for the fatigue, and the experience is enhanced. 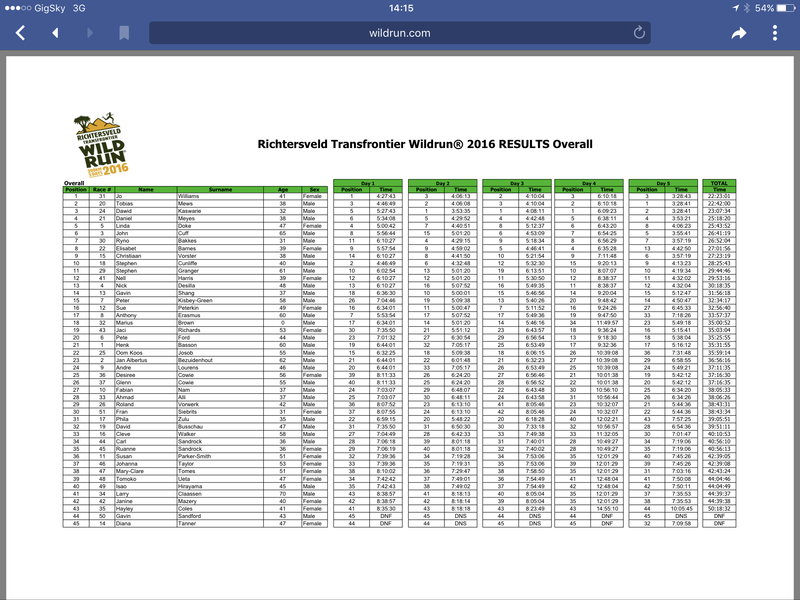 Richtersveld Transfrontier Wildrun is so much more than just a race! A lack of modern technology and connection provides a release and a re-birth; it provides an awareness and an understanding of what really does matter in the world in which we live - freedom! For the first time in the race history, 2016 had an outright female winner in Joanna Williams who resides in New Zealand. From day one she ran a smart race and the small time gains made on the opening stage were held all the way to the line. Tobias Mews from the UK may well have offered a challenge to Jo, but ultimately he ran side-by-side preferring to experience the race instead of blasting through with no opportunity to stop, look, listen and let the environment absorb. Local runner, Dawid Kaswarie, was to many the true winner of the race. He had no GPS, his map reading skills were negligible and an error on day one gave him a one-hour time penalty. Had he had the autonomy to run alone, the race would have been his. It's something that Tobias acknowledged at the awards ceremony. Standing with a huge trophy, Tobias thanked the race, the other competitors and acknowledged his gratitude for being the first male runner, however, in the true spirit of the race and the Richtersveld race, he called Dawid up to take his trophy, 'this is the true champion' he commented and we all agreed... A few tears were shed! In the men's race, the final podium place was taken by Daniel Meyes and what a story he had. Travelling from Europe, he had planned to travel to the Richtersveld by motorbike after arriving in South Africa. Hiring a bike, he set on his way for the 9+ hour plus journey only to find that the bike would break en-route. A 20km walk for help and a late arrival just before the race start was not the best preparation but somehow he came through running a very solid race. But like all races, it was in an amongst the line-up of finishers where some real grit and inspiration could be found, for example, 70-year old Larry Classen who completed the race with his daughter. Or Hayley Coles (UK) running her first ultra, fighting for the finish line and achieving it. Every runner has a story, and they all provide an insight into why the Richtersveld Transfrontier Wildrun is THE must race to do. Yes, you can race, but to do so and not embrace those around you, to not embrace the landscape and the environment, to not disconnect and reflect would ultimately mean that despite winning you will have lost. This race is so much more than a race - it's a life changing, life affirming and life waking experience that made all those who witnessed it re-evaluate and leave with a new perspective on life. Travel is not about escaping life; it's about not allowing life to escape us! Daily race summary posts and images HERE. My first ultramarathon - I was inspired after seeing some photos by Ian Corless, and seeing people who were less able bodied than me at the MDS talk. Only been running for 7months I wasnt sure I would finish. I did! it was truly unbelievable, the organisation/support, the food, the tents, the physio, the other runners - the scenery, was breathtaking, I have fallen in love with South Africa. This is not for the faint-hearted, I was a new runner - on my feet 8.5hours per day, over 14hours on the long 50k day. You also need to be able to navigate with a GPS. However, I was never on my own, the Sweeper Richard ensures the last person is looked after and I feel I have met some amazing friends that treated me like a superstar. In a way I was glad I was last to get such support from elite and other more experienced runners. Each day was different scenery which you will never forget, from sunsets, to navigating by moonlight - we were the first to run down a river to Ai Ais Hot Springs across a border to Namibia. The final mountain was so steep on the last 3k to the finish, I just stood and looked around - feeling like I was on top of the world! If I can do it with 7 months running, anyone can - one for the bucket list!